lecture hall H 3005 in the Main building of TU Berlin (Str. des 17. Juni 135, 10623 Berlin). During his life, Tobias Brandes garnered both international scientific recognition and the respect and affection of the people he met. This site has been set up to make it possible for those away from Berlin to express their condolences. I only met Tobias a few times but remember these meetings very well. It was such a pleasure to talk and discuss with him. I’m very thankful I had the chance to know him. Being the supervisor of my undergraduate summer research project, final year project, and PhD projects, Tobias was unarguably the most influential figure in my academic career. Although I might be his worst PhD student in term of carrying on what he had been doing, his scientific enquiry methods and ethics have always been my guiding principles in starting my research in remotely new areas. There is no language for me to express my gratitudes to Tobias. May he rests in peace. Tobias was a fantastic researcher with a great instinct for the right physics. He was a visionary in the application of quantum optical methods to solid state physics long before it became fashionable. I am glad that I knew him. What a loss! I meet Tobias in my first years as a PhD, when I visited him in Manchester, just before he moved to Berlin. In the many times I met him afterwards in conferences or visiting his group he was always welcoming and friendly. Meeting him was a great pleasure for his particular human qualities as well as for being a constant injection of inspiration. From him I learned counting statistics, but most importantly, a way to live science and research as a fascinating game. The fact that this will not happen again is extremely sad. I can only be grateful for his friendship and support. It is with deep sadness that I recieve the news of Tobias Brandes having passed away. I had the privilege to have him as one of the examiners of my Ph D thesis. Throughout the years I have learned a great deal from the unique insight of his work. I would like to express my most sincere condolences to his family and friends. Mit Tobias verlieren wir einen geschätzten und besonders herzlichen Kollegen. Ich fühle mit seiner Familie und seinen Mitarbeitern. Since the first time I met Tobias I could understand why everybody has such a good opinion about him . He was really kind and always had good words and gestures for all. I was lucky to share discussions elaborating on crazy ideas with such an expert scientist. One could clearly see that he enjoyed doing physics. My sincere condolences to his family and group. I would like to express my deepest condolences and sympathies to Tobias' family and friends for a great person and great scientist. Eine traurige Nachricht, die mich zutiefst bestürzt. Herr T. Brandes war ein herausragendes Beispiel an Physiker und Hochschullehrer... bei ihm hat Lernen Spaß gemacht und man hat auch was mitgenommen. Spaß am Studium zu haben und mit Fleiß und Engagement dabei zu sein. Vielen Dank für die tolle Zeit bei Ihnen. Wir werden Sie vermissen. Ruhen Sie in Frieden. It is a terrible and very sad news that Tobias Brandes passed away. Our community looses a great and open mind and a wonderful colleague. My deepest condolence to his family and friends. I am very saddened to learn that Tobias died. I was very fortunate to have the opportunity to work with Tobias at the early stages of our careers at the University of Hamburg. We continued to work together even when we were at different institutions. He was a gifted scientist, a gentlemen and a friend. He won't be forgotten. May Tobias rest in peace. It was a profound shock to hear Tobias’s loss. I still remember the nice moments with him and his wife, Natsuko-san, when I visited Hamburg. I would like to send my deepest sympathy to his family. I am still shocked about the sad news that Tobias has passed away. Tobias was a fantastic scientist and person. He was a deep thinker with highly original ideas. He changed direction repeatedly and thereby opened novel avenues for research. Tobias invited me to visit him in Berlin for one month in February 2008. It is only recently that I realized that this was a career-defining visit. Tobias showed me his draft on waiting time distributions in quantum transport, which is a topic that I have been working on ever since. We also started our collaboration on universal oscillations in counting statistics, which is another topic that I am still working on. As such, Tobias has had a tremendous impact on my scientific career. I am sure that he has influenced many others in a similar way. In addition, Tobias was a great role model to other scientists. He was kind, humble, and humorous. I will miss him very much. My condolences to his friends and family. First I express my sincere condolences to Prof. Brandes's family. We shared the same office when we were a young student and a post doc with Prof. Shimizu and we talked a lot about science, Japanese cultures and others. About 10 years later since then, when I applied to the Humboldt fellowship in Germany, I asked Brandes-san to write me a recommendation letter. I still remember that his letter was very powerful with unearned evaluation of me, and I felt both embarrassed and honored. While I luckily worked in Germany, we once met in Berlin, and he and his wife kindly guided me and my wife around the cities of Berlin and Potsdam. After that, we met several times in Japan, and the last thing I remember is that he said he wants to have a special conference in Berlin when he turns 60. That will not happen, which I am very very sorry. and am truly grateful that I had the privilege to share fruitful years with him at the 1. ITP in Hamburg as a fellow researcher. I'm very sad for the sudden and unexpected passing of Tobias. He was a great physicist and better person: our collaborations and meetings were always a pleasure since Tobias was an incredibly nice person with such a charming and friendly character. We will miss him very much. My thoughts are with Tobias' family, specially his beloved Theo: I hope that you will read this book of condolences and feel proud of all the respect, sympathy and love that your dad garnered from friends and colleagues all around the world. 20 years have passed since I met Tobias and his wife in Tokyo and was impressed with his kindness and passion. He gave me a good advice, which has always been in my heart. I will never forget the days I spent with him in Hamburg. I wish to express my condolences to Tobias' family. I am deeply shocked to hear of the sudden loss of Brandes-san. He was a posdoc in my group from 1997/2 to 1998/1. He was a special person. He visited my laboratory almost every year. I and all members of my group loved him very much. I would like to offer my deepest sympathy. Many of us at Gakushuin University still clearly remember those good old days when Tobias (we used to call him "Brandes san") was a posdoc here. He visited us briefly recently, and we were talking about possible longer visit with his family. Tobias was always brilliant, cheerful, and charming. He was a kind of person who makes people around him happy. It is too big a loss not only scientifically but also personally. We would like to express our deepest condolences to everybody close to Tobias, especially to his family. Totsuzen no kanashii shirase ga imadani shinjiraremasen. Brandes san no atatakai egao wo omoidasuto dounimo yarikirenai kimochi desu. Kokoro kara okuyami wo moushi agemasu. My deepest condolences to his family. He visited my institute several times and gave impressive seminars, after which we went to German and Japanese restaurants in Tokyo, which we enjoyed a lot. Last time we met was in the middle of July 2014 in Tokyo. I still can not believe that the occasion became the last. Das plötzliche, viel zu frühe und unerwartete Hinscheiden meines ehemaligen Doktoranden Tobias hat mich zutiefst im Innersten berührt. Tobias war ein herausragender, international hoch anerkannter Physiker ausgestattet mit großer Fantasie und sehr hoher wissenschaftlicher Kreativität. Als akademischer Lehrer und empathischer Betreuer seiner Studenten erfreute er sich sehr breiter Anerkennung und einer außerordentlichen Beliebtheit. Mit seiner ungewöhnlich ausgeglichenen und fröhlichen Persönlichkeit hat er maßgeblich zu dem positiven Arbeitsklima und den Erfolgen meiner Arbeitsgruppe an der Physikalisch-Technischen Bundesanstalt Braunschweig und später an der Universität Hamburg beigetragen. Dafür war und bin ich ihm tief dankbar. Tobias war für mich in der Tat wie ein Sohn. Umso mehr und nachhaltig berührt mich sein früher Tod. Tobias hinterlässt nicht nur eine große wissenschaftliche Lücke sondern trifft mit Sicherheit auch die Menschen seines engeren Umfeldes tief. Es fehlen mir die richtigen Worte meine innere Betroffenheit richtig aus zu drücken. Ich trauere mit seiner Familie, seiner lieben Frau Natsuko und seinem Sohn Theo. Tobias fehlt mir und wird noch lange in meiner Erinnerung weiterleben. Mit tiefer Bestürzung habe ich vom Ableben von Tobias Brandes erfahren. Ich habe ihn als aufgeschlossenen, hochintelligenten Studenten in Göttingen kennengelernt. Anfang der neunziger Jahre hat er in meiner Arbeitsgruppe unter Anleitung von Willi Zwerger seine Diplomarbeit angefertigt. Viele Jahre später habe ich ihn zu einem Vortag nach Göttingen eingeladen und war von der Breite seiner Forschungsarbeiten beeindruckt. Sein verschmitztes Lächeln werde ich in Erinnerung behalten. Tobias was an upstanding scientist, who opened new research avenues, with creativity and enthusiasm. He will be very much missed. My deepest condolences to Tobias Brandes' family. I will always remember him as a scientific inspiration and a truly kind and generous man. Der viel zu frühe Tod von Tobias hat mich zutiefst getroffen. Tobias war einer meiner ersten Tutoren in meinem Studium und es war eine Freude unter seiner Anleitung zu lernen. Wir haben uns dann als "Emigranten" in England wiedergetroffen, er in Manchester und ich in London. Unsere gelegentlichen Treffen dort und später in Berlin über die Jahre waren auch durch seine freundliche Persönlichkeit ein Vergnügen. Es gibt wenige Kollegen, die ich persönlich so geschätzt habe. I knew Tobias over 20 years, he visited us in Poznan several times. We will remember him as a very nice, warm and friendly person. We are still shocked by the sad news - he left us too early. Tobias told about his wife and especially son with great love. We would like to express our sincere sympathy to his family. I would like to express my deepest condolences to his family and friends. Tobias was as good a scientist as better person. Ich hatte die Freude, Tobias schon Anfang der 90'er Jahre als Student in Göttingen kennen zu lernen; er war ein Jahrgang über mir. Wir haben nicht nur die Freude an der Physik geteilt, sondern auch die an klassischer Musik und gemeinsam in der Akademischen Orchestervereinigung musiziert. Die Nachricht, dass wir ihn verloren haben, hat mich tief getroffen. Mein herzliches Beileid seiner Familie. Ich hatte Tobias viele Jahre lang immer wieder gesehen und kennen und schätzen gelernt. Zuletzt haben wir gemeinsam eine Antrag für ein Marie Curie Projekt gestellt, wo wir uns in Zukunft noch häufiger getroffen hätten. Es war schockierend zu erfahren, dass wir nun einen so jungen und erfolgreichen Kollegen verloren haben. The message of Tobias unexpected death was a great shock for me and left me with a deep sadness. He was a great and reliable mentor. I will miss his advice and his passion for physics. I would love to say to him: "Tobias, thank you for everything." I cannot imagine how painful this must be for his family and friends. My thoughts are with you. Mit Prof. Tobias Brandes verlieren wir einen von uns sehr geschätzten Kollegen aus der Physik an der TU Berlin. Mein herzliches Beileid seiner Familie. Seine Persönlichkeit wird uns allen fehlen. The sad news that Tobias is no longer with us is a great shock for all those who knew him. He was an excellent and broadly knowledgeable scientist and a human being of an extraordinary kindness: open, friendly, modest and always cheerful. I was fortunate to work with Tobias at the time of his Diploma and beginning Ph. D. thesis in Göttingen. My sincere condolences go to his family. He will definitely stay in our memories. I will remember Tobias as an exceptional and enthusiastic scientist, highly educated man and a great mentor. His modest personality and optimism always made me look forward to our next meeting. My condolences to his friends and family. Mein aufrichtiges Beileid für diesen schweren Verlust. Prof. Brandes war ein ausserordentlicher Physiker und fantastischer Betreuer. Ich habe sehr viel von Ihm gelernt und bin Ihm dafür sehr dankbar. I wish to express my condolences to Tobias' family. I remember Tobias as a good friend and great scientist. My deepest condolences to Tobias's family and friends. I am really sorry the Tobias premature leave. I remember my first contact with him after reading his pedagogical notes "quantum dissipation", which were my first incursion in the field of open quantum system at the begining of my PhD. My thoughts are with his family and friends. I am deeply shocked by the sad news of Tobias' passing. Tobias was a much appreciated colleague of mine at UMIST in Manchester, and a friend. His work clearly blossomed after leaving Manchester, and I am humbled by his productivity. He still had so much more to do and to give to our community. My sincere condolences to his family: my thoughts are with them. 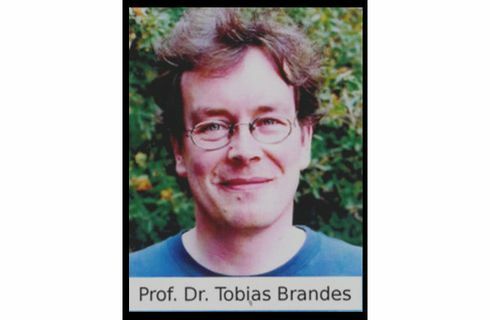 My deepest condolences to Prof. Tobias Brandes' family, his research group and faculty colleagues. He was a truly outstanding scientist in every sense that matters: in research, mentoring and collegiality. We will miss him very much. I met Tobias for the first time at PTB in Braunschweig in 1993. At that time he was a brilliant PhD student with whom I had the opportunity to discuss and to share a nice time. Since then, I have been in contact with him and we established a long standing friendship and collaboration. Tobias was a very creative and very good scientist, full of enthusiasm, who explored different problems. He did important scientific contributions in mesoscopic systems, in topics as diverse as quantum optics, non linear systems, topology, spintronics and thermoelectricity. It was for me a great honour to collaborate with him. More important, Tobias was a very nice and cheerful person, always ready to help everyone and to participate in any initiative. It was a tragedy that Tobias left us so soon. He leaves a void impossible to fill. His memory will remain always with us. I want to express my most sincere condolences to his family and friends. When I learned about the sad news, I was really shocked. He was still so young. It is difficult to believe. We will miss a great scientist and very good friend. My deepest condolences go to Tobias's family. Tobias was a great supervisor, a very good friend and an extremely talented theoretical physicist. My family and me will be always grateful for what you have done for us. I will miss our discussions, his enthusiasm and his passion for physics. What an irreplaceable loss for his family, science and humankind! This is all but very, very sad. Tobias will stay for us "alive" forever however, with his wonderful, inspiring and guiding scientific oeuvre. I am confident that his scholars, together with others, will continue to do great science in the spirits he initiated. My deepest condolences. My deep condolences. What a loss for his family, his friends and the science community. I am very saddened to hear of the sudden death of Tobias. We knew each other since the time we were Postdocs in the late 90ties and had always kept good contact with each other. Even if we only finalized one common publication, we had plenty of exchange. Here I was particular impressed by his virtue to bring things into a nutshell. I will miss this as well as our conversations on music and other important things of life. My thoughts are with his family. Tobias was not only an excellent and inspiring scientist, but, above all, a wonderful colleague and a true friend. I am very sad about this loss. My deepest condolences to his family. Sudden loss which can be never repaired. I will always remember our encounters. I am deeply shattered by the terrible news. I remember Tobias as such a kind, open, enthusiastic person, full of energy, and as a scientist one can look up to. I am particularly saddened when I think of the child and wife left behind. My most sincere condolences to them, with deepest sympathies. I knew Tobias as an excellent physicist and a wise, educated person. I appreciated his positive, helpful and generous attitude and his very modest nature. I will miss him as an exceptional collaborator as well as a great man. It is hard to express how much I regret Tobias’ unexpected passing. I share my deep sympathy with his family, friends and colleagues. My deepest condolences to Tobias's family, colleagues and students. It was my great pleasure to visit the group Dec. 2016, and meet Tobias and his energetic research group. While meeting him personally only recently, I have 'known' Tobias scientifically for many years, by reading so many of his research papers. As well, one of the resources I have been using for my advanced graduate class teaching (in Toronto) was based on Tobias's course notes, which he was generous to share free of charge, online. Tobias's beautiful research papers convey his special characteristics. I will read them remembering and missing a great scientist. My deep condolences. I will always remember the example of human openness and scientific rigor received from Tobias. Tobias, you were a great scientist and a wonderful person. I can't believe that you are not with us anymore. We will miss you very much. My deepest condolences to your family and friends. I did not know Tobias well, but I had the honour to collaborate with him on one paper following a visit to his group. Though only from that, I appreciated his warmth and carefulness. His death comes as a shock. It is a great loss to science, and, I'm sure, his colleagues and family. I was a young PhD student when I first met Tobias at a summer school he organized. Fifteen years later, he had become one of my main collaborators. What struck me throughout this period is that Tobias was not only a great scientist genuinely interested in his research, he was also an extremely kind, humble, and profoundly humane person. I will really miss him. My deepest condolences to his family and his group members. I was deeply shocked by unbelievable decease of Tobias. We knew each other for many years. I appreciated his research very much and visited him many times. Each visit and discussions with Tobias and his colleagues were extremely stimulating for me. I will miss Tobias. I convey my deepest condolences to his family and friends. My deep condolences. I have always appreciated the rich scientific competence and the solid human values of Tobias. I had the luck to know him on both sides. I miss him. I wish to send my profound empathy to the family and all the member of his group. I feel extremely saddened by the untimely death of Tobias. He was an incredibly kind person and a most appreciated colleague. My thoughts are with his family and the many friends he leaves behind. My deepest condolences to his family. I have very good memory of Tobias for his scientific and human sides. Tobias, Du warst ein großartiger Mentor und Freund. Danke für alles. Du wirst sehr fehlen. I had the luck of spending a few weeks in Prof. Brandes' group in 2007, and that has been an extremely stimulating experience for me. It was the basis for a friendly relationship with Prof. Brandes and several of his coworkers. I've learned only today of Prof. Brandes sudden departure, and this sad news has been a real shock for me. I’d like to express my deepest condolences to his family and friends. This website is set up and maintained by members of his former research team. Messages will be reviewed prior to publication. If you wish to express your condolences in a different form, please contact us directly.